Richlawn Winterizer supplies the university recommended 1 pound of nitrogen per 1,000 square feet. Richlawn Winterizer is made in Colorado and is designed for use in the western United States. 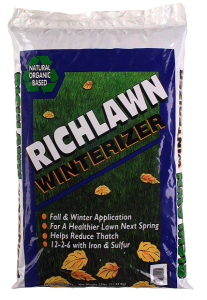 Richlawn Winterizer is unique in its offering with its organic base. Apply September through November. More than one application may be made if desired. After applying Richlawn Winterizer, water normally. To avoid rust spots on concrete areas, simply sweep any fertilizer from these areas before watering. During dry periods of fall and winter, water your lawn every 5-6 weeks when temperatures are above 45 degrees.